If you’re someone that likes to stay organized, especially when using Microsoft Office Excel, the ROUND Function can help you round all your figures to any placing you may need. The ROUND function is a simple formula that takes the figures in your data set and automatically rounds them to the place you want to set. When you have large amounts of data and numbers sitting on an Excel file, it could potentially take a lot of your day to try and manage these figures to present the proper format you’re looking for. By using this function, you can simply implement the format placement you need with one function. Read how you can use the ROUND function below. Start by downloading the sample document available for free at the bottom of this page. You can also choose to use your own document and begin using the ROUND function right away without practicing first. The function will usually follow the same basic structure to begin, “=ROUND=(X,Y).” In this formula, X is the value or cell you want to change and Y as the placement you to round that number to. You can use the ROUNDUP, ROUNDDOWN, and MROUND functions in a similar way. The purpose of the ROUNDUP function is to round the numbers up to a particular amount throughout your document. 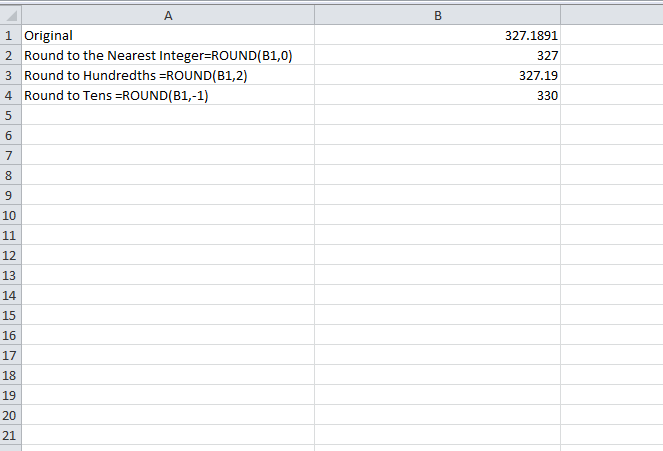 The ROUNDDOWN function is for, you guessed it, rounding your numbers down to a certain amount through your spreadsheet. The MROUND function a little different from the others. The purpose of this function is to round figures to a specific decimal place, even for vastly long numbers. Instead of entering the same formula above, X in this instance will represent the number you want to round and Y is the multiple to round to.